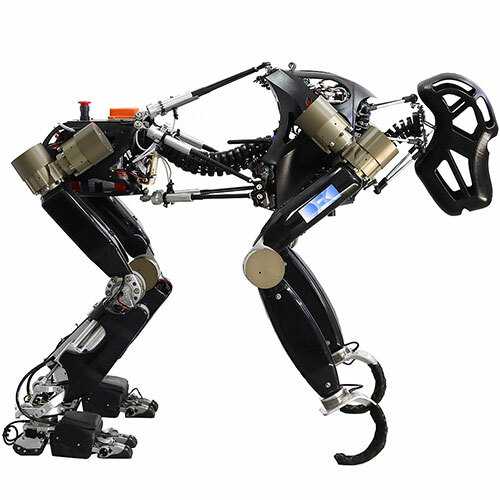 Charlie is a legged robot that can switch between quadrupedal and bipedal locomotion. Just like a chimp, it moves around on all fours, and when it needs to grasp something, it uses its forelimbs. Close-up view of the robot's spine. 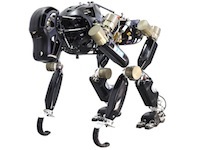 Charlie is based on a chimp, but its creators were inspired by an earlier project that involved a robotic scorpion. 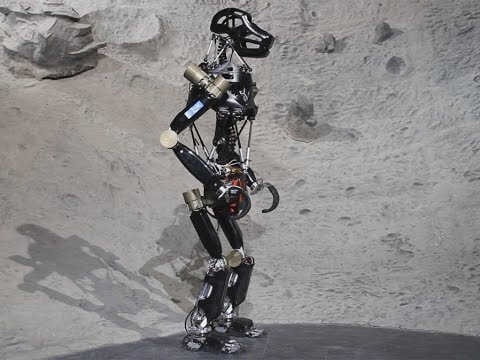 The robot's creators hope it will provide insight into how bipedal walking evolved in humans. 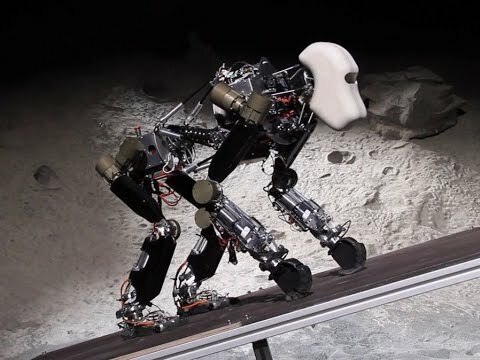 Charlie stands for Combined Human and Ape-like Robotic Locomotion for iStruct Experiments. Equipped with a mechanical spine that bends in multiple directions and measures the applied forces and torque. Feet have embedded tactile sensors. 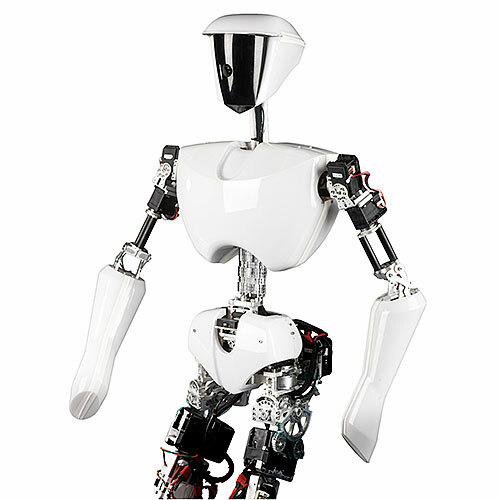 Torso: two inertial measurement units (IMUs) for 3D orientation and 3D acceleration. 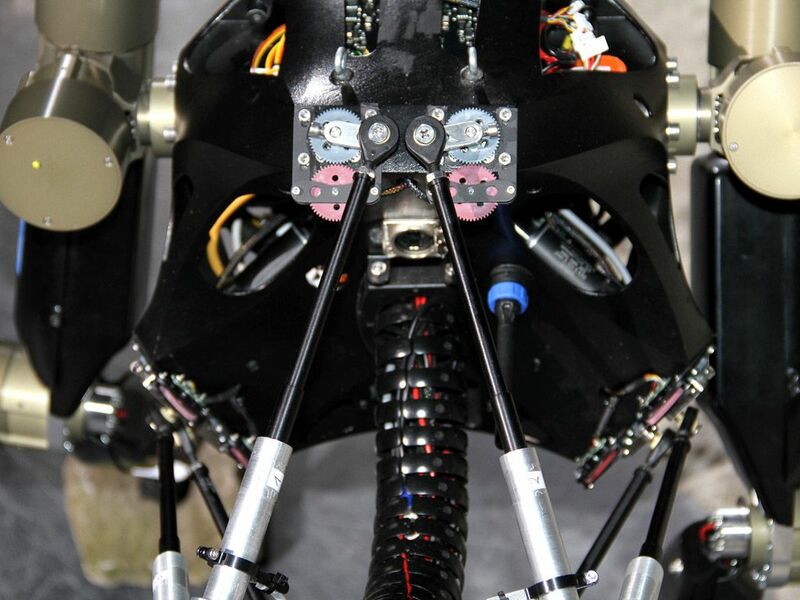 Limbs: 6-DOF force/torque sensors. 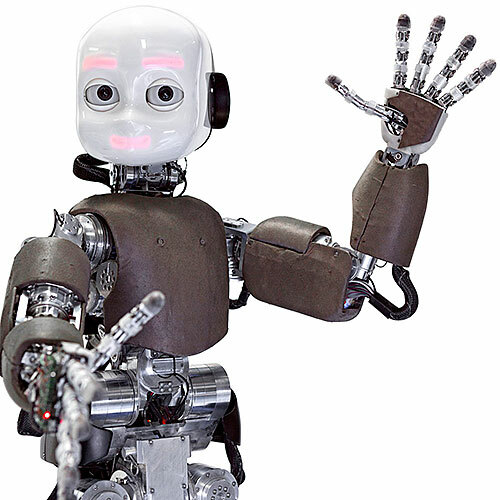 Feet: tactile sensors, acceleration sensors, and absolute encoders. Spine: force sensors. Additional current, position, and temperature sensing on each joint. 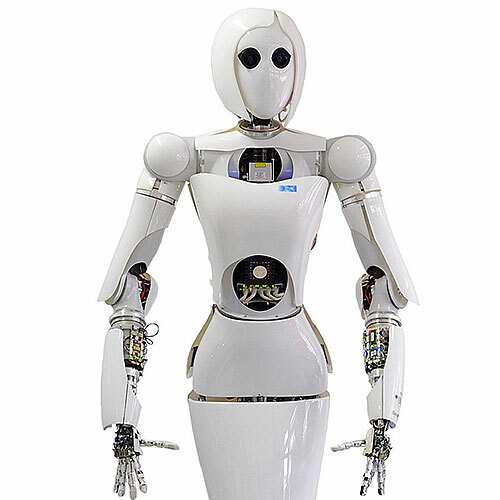 Seven brushless DC motors on each posterior limb; 4 brushless DC motors on each anterior limb; 6 brushless DC motors for spine actuation; 6 brushless DC motors for head actuation. ARM Cortex-A8 and wireless 802.11b/g inside torso. Custom FPGA-based controller on each joint. Linux OS and custom control software with C, C++, and VHDL. Spine: carbon fiber and aluminum. Body and feet: aluminum. Legs: milled aluminum and plastic. 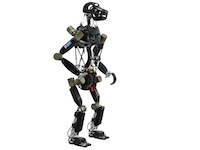 The researchers at the German Research Center for Artificial Intelligence (known as DFKI) who built Charlie have a long history of studying legged robots. 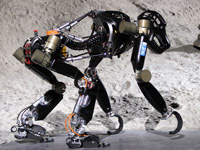 One of their first projects, more than 15 years ago, involved teaching a hexapod to walk on different kinds of terrain. 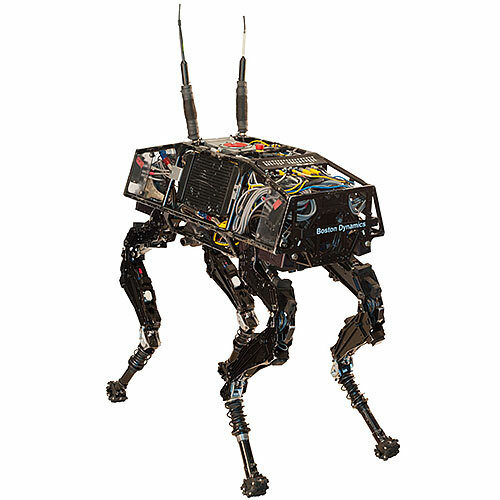 Next they developed robots with eight legs based on the biological model of the scorpion. 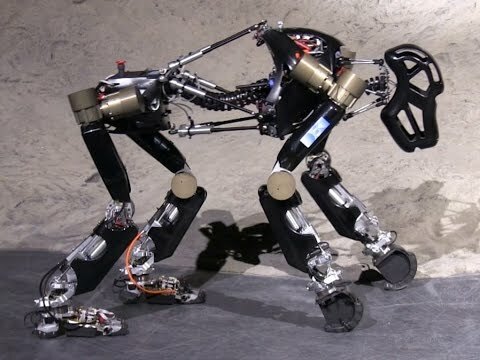 Those projects showed that legged robots can improve their agility by monitoring the contact forces between their limbs and the ground. With Charlie, the DFKI team wants to develop sensor-packed feet that precisely keep track of ground forces. 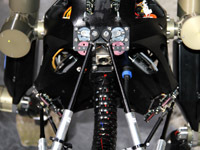 The robot will be able to react to these forces using active mechanisms like a flexible spine. 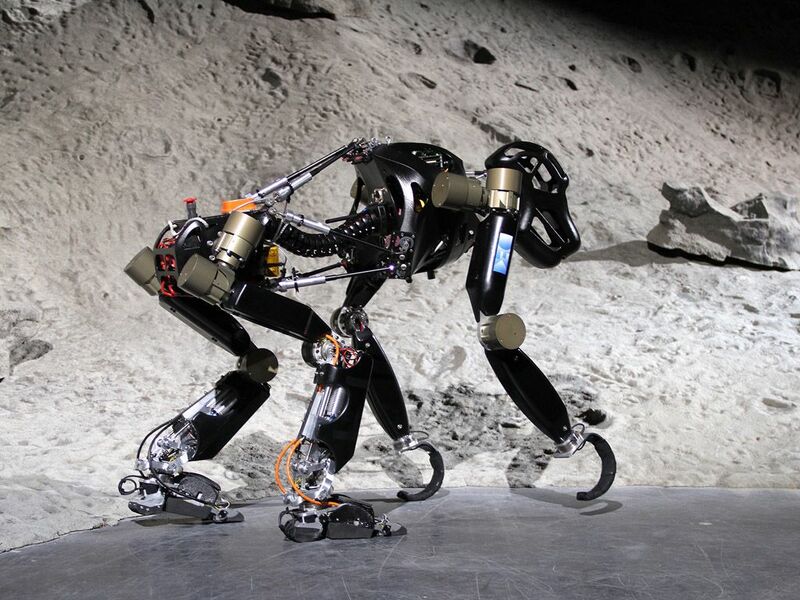 Charlie, which is part of DFKI's iStruct (intelligent structures) project, will help researchers develop control approaches for quadrupedal and bipedal locomotion and, they hope, provide insight into the evolution of walking in humans.